What is Systematic Kinesiology and how does it work? Many people are under the misapprehension that Kinesiology is muscle testing. This is certainly not the case. Systematic Kinesiology is a safe, gentle and effective holistic therapy used to restore balance to the whole organism (the person). Muscle testing is an aspect of Systematic Kinesiology used to ascertain the areas of weakness/imbalance within the body and to identify what the body needs to strengthen those weaknesses/imbalances. This may include nutritional support, and/or balancing correction techniques. These weaknesses will become symptoms if not treated and the body rebalanced. How are the muscles tested? You will be asked to put your arms and legs in specific positions. Each of these positions tests a specific muscle. You will be asked to hold your limb steady whilst I apply gentle pressure to it, while assessing whether your muscle is able to hold it’s strength against my pressure or not. What does the muscle test assess and how? Each muscle is controlled by electrical circuits in the body, via the central nervous system. Each circuit involves muscles, organs and systems. By assessing the strength of a muscle we can get an idea as to the general balance/strength of that muscle and/or the organs and system related to it. It is important to stress that Kinesiology and muscle testing does not diagnose disease. Muscle testing allows analysis which detects functional imbalances. If these imbalances are ignored and allowed to accumulate disease may follow. How do imbalances happen and how are they corrected? Imbalances can be due to emotional stresses, nutritional deficiencies, blocked energy, structural problems or any combination. 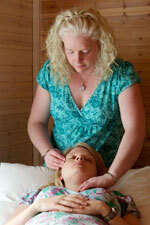 The balancing techniques include rubbing of lymphatic stimulus points, holding of neuro-vascular points and acupressure points and working with meridian energy flow. There are also additional techniques/corrections for specific conditions that may be incorporated into your balance. If your imbalance is due to digestive or endocrine (hormonal) general disturbance I will use a whole system balance focusing specifically on these areas. Do the correction techniques hurt? There may be a level of discomfort experienced during the rubbing of the lymphatic points and these can be sore the following day. If there is discomfort there is congestion that needs to be released, however I will always work within your tolerance levels. Does clothing need to be removed during treatment? No clothing need be removed, however footwear will need to be removed for me to access specific acupressure points and loose clothing is advisable.